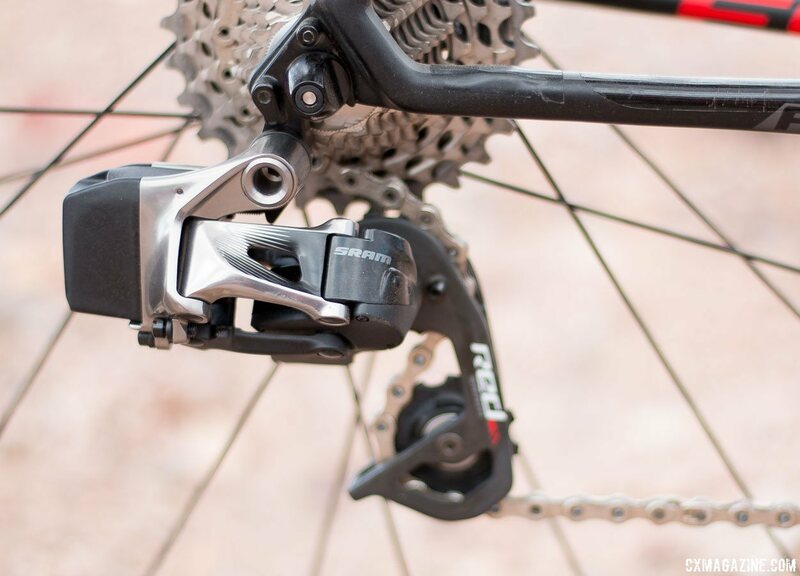 At Eurobike 2015, SRAM unveiled its long-awaited electronic wireless drivetrain, named SRAM RED eTAP. At Interbike 2015, Cyclocross Magazine had one of the first rides on the new drivetrain. While the first test was on a Focus road bike equipped with road tires, you can be sure of one thing: I was evaluating the SRAM RED eTAP componentry on their cyclocross and gravel-worthiness. 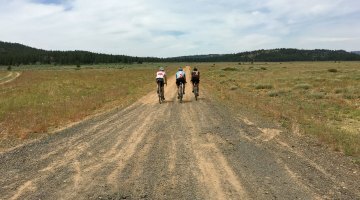 Maybe you’ve read a few words already about the group on road-oriented websites, but we sought to bring a cyclocross and gravel-dirtied lens to view the new electronic and wireless group. 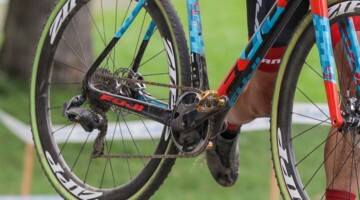 SRAM has its cyclocross-oriented Force 1 (formerly CX1) component group, and nearly all of its sponsored cyclocross athletes will remain on Force 1 this season, with a few notable exceptions, such as Wout van Aert riding with SRAM RED 22 mechanical at CrossVegas. But you can be sure that enthusiasts building their dream cyclocross or gravel bike, and racers looking to try the latest and greatest, will be anxious to test the new electronic group in the harsh elements of cyclocross and gravel riding. As CXM’s resident senior bike geek, I certainly fall into that group. 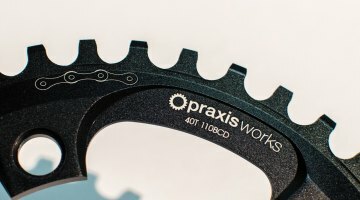 On paper, SRAM’s accomplishments are impressive, and there are a few attributes that separate it from Di2 and Campagnolo. The SRAM RED eTAP wireless system makes installation easy, quick and clean, eliminating battery or wiring placement concerns. Also, in typical SRAM fashion, the system also gives a nod to weight weenies, with a negligible weight gain over its already lightest-in-class RED 22 mechanical groupset (when you consider the weight of cables and housing with the mechanical system). It’s also more than half a pound lighter than Di2 for a full component group. See the table in our slideshow for full SRAM RED eTAP component weights. 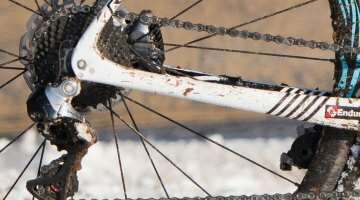 Before we start a debate as to whether pricey electronic components are right for off-road adventures, let’s start with a review of some of the pros and cons of any electronic drivetrains in cyclocross and gravel that we’ve learned over years playing with Shimano Di2 on multiple test bikes. If you’re already sold on electronic shifting, skip ahead to the second slide. Less maintenance: Because of much of the above, there’s less to lube, adjust or replace. 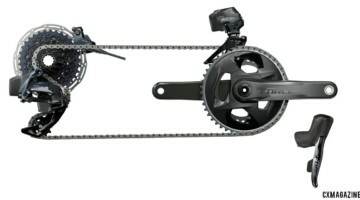 Smarter, more full-proof system, since you can’t force a rear derailleur and the chain across a cassette when you’re not pedaling, or when things are jammed. That saves rear derailleurs, hangers, and chains. Keep reading on the next page for SRAM RED eTAP ride impressions and a summary of initial observations. I recently got a new bike with eTap. My main complaint is on a wired bike, the right paddle shift to a lower gear ratio, the left paddle shift to a higher gear ratio. On the eTap its just the opposite. Although the eTap comes with a device for updating the software (none available to date) Sram does not let the user switch these. Its taking me some time to get use to.